Whether you’re just starting out, well on your way to living your dream or eagerly approaching retirement, make sure you’re financially prepared to achieve a lifetime of goals. We can help you reach them with a personalized financial plan. We will apply time-tested strategies, providing education and expert advice to help you make decisions based on your priorities. And as your circumstances and priorities change over time, we’ll work with you to revise your plan so you can meet each of life’s challenges head on and celebrate your accomplishments along the way. Identify your goals. First, we’ll make sure we understand what’s important to you and your loved ones, where you are today and where you want to be in the future. Develop your personalized plan. we’ll then analyze your financial situation and develop recommendations that can help you and your family achieve financial security. Implement your strategies. 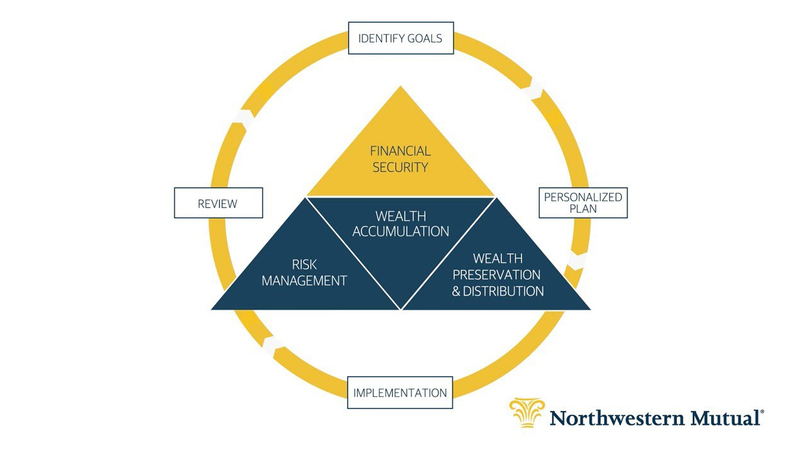 Together, we’ll bring your financial plan to life with proven financial products and quality solutions. Review your plan. Even small changes in your life can impact your financial plan. We’ll help you adjust your plan as needed to stay on track. And although your financial strategy will be unique to you, we’ll ensure that it’s built on a solid foundation to help you protect against the unexpected, accumulate wealth and preserve what you’re working so hard to achieve. If you’re a business owner, we recognize there’s no separating the goals you have for your family and the goals you have for your business. That’s why we offer a process that addresses both, allowing you to create a competitive business advantage and live the life you envision. You’ll be supported by a team of experts who specialize in business planning – such as employee benefits, insurance and exit planning – alongside those who specialize in personal financial planning and estate planning. Learn more about the business planning, products and solutions under the Services tab on this website. Regardless of whether or not you own a business, our personalized approach to financial planning is much like building a custom home – designed to your specifications, built to meet your goals. Then, take the first and most important step toward creating a lifetime of financial security. Contact me to set up a meeting. And in the meantime, consider downloading and completing our Guide for the Future. It’s designed to help you record important information and clarify and document your financial goals. Gregory Hendrix uses Physicians Nationwide as a marketing name for doing business as representatives of Northwestern Mutual. Physicians Nationwide is not a registered investment adviser, broker-dealer, insurance agency or federal savings bank. Northwestern Mutual is the marketing name for The Northwestern Mutual Life Insurance Company, Milwaukee, WI (NM) (life and disability insurance, annuities, and life insurance with long-term care benefits) and its subsidiaries. Gregory Hendrix is an Insurance Agent of NM and Northwestern Long Term Care Insurance Company, Milwaukee, WI, (long-term care insurance) a subsidiary of NM and a Registered Representative of Northwestern Mutual Investment Services, LLC (NMIS) (securities), a subsidiary of NM, broker-dealer, registered investment adviser and member FINRA (www.finra.org) and SIPC (www.sipc.org). Gregory Hendrix is primarily licensed in Alabama and may be licensed in other states.